Dr. Lisa Larkin is a board-certified internist who has been practicing internal medicine and women's health in Cincinnati since 1991. After 11 years of teaching and practicing at the University of Cincinnati College of Medicine in the Department of Internal Medicine, she opened her own internal medicine and women's health practice guided by a philosophy of providing high-quality, evidence-based personalized care to patients. Her larger vision was to create a comprehensive, evidence-based, primary care and multispecialty health center for women. In 2012, that vision became reality as she rejoined UC Health to design, develop and direct the UC Health Women's Center, and her practice transitioned to UC Health as one of the Center's satellite locations. 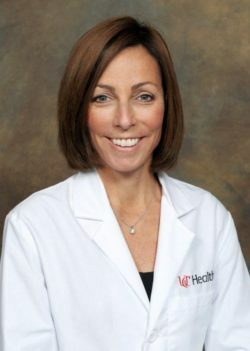 She currently serves as director of the Center and is an Associate Professor and Director of the Division of Midlife Women's Health and Primary Care in the Department of Obstetrics and Gynecology at the University of Cincinnati. Although Dr. Larkin continues to practice general internal medicine and cares for both women and men, she has a specific interest in women's health, particularly the care of women during the perimenopause and menopause transition and female sexual issues. In 2001, she completed an advanced credentialing course in menopause and menopause management and is now a certified menopause clinician through the North American Menopause Society. She is committed to providing current, evidence-based care to her patients and is especially passionate about the care of women at midlife. She lectures regularly to the community, as well as to medical students, residents and practicing physicians on various topics in women's health. Dr. Larkin earned her undergraduate degree from Skidmore College in upstate New York and her medical degree from Yale University's School of Medicine. She completed her internal medicine residency at the University of Chicago Hospitals and became board certified in 1991 (re-certified in 2001 and 2011). Dr Larkin became a Fellow of the American College of Physicians in 2012. For more information or to make an appointment with Dr. Larkin, call (513) 475-UC4U.